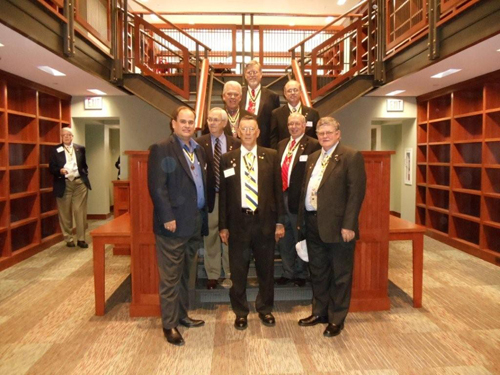 During the Fall Leadership Meeting held in Louisville, Kentucky, on September 24th-25th, MOSSAR State President Clifford Olsen and members of the MOSSAR Color Guard team, attended the the grand opening of the new NSSAR library in Louisville, KY. The NSSAR Library is housed in the historic district of Louisville directly across the street from the Louisville Slugger Museum, and separated by one building from the Frazer Arms Museum. The SAR now has a world class library facility in a location that is easily accessible to the public at large. The ceremony was held on Saturday, September 25th, and included presentations by President Generals David J. Sympson and Larry D.McClanahan (2001-2002), Librarian General Miles K. Dechant, C. Bruce Traughber, Head of the Louisville Economic Development Agency, architect Daniel S. Preston, and general contractor Leo Post. Photo - Front Row: (L-R) Clifford Olsen, MOSSAR State President; Major General Robert L. Grover, MOSSAR Color Guard Commander; and Brigadier General Gerald R. McCoy. Photo - Center Row: (L-R) Past MOSSAR President and Trustee Daniel R. McMurray; and Brigadier General Russel F. DeVenney. Photo - Top Row: (L-R) Major Keith Brown; Milan A. Paddock, President of Spirit of St. Louis, and Brigadier General Steven M. Baldwin.